As BMW strive to create the zero emissions vehicles of tomorrow, forty electric MINI E cars have been handed over to their test drivers, who are all members of the public. This field trial will evaluate the psychological, social and technical aspects of living with an electric car. The findings will be used to help guide power providers, policy makers and component manufacturers in their decision making about the cars of the future. The front wheel drive, two-seater MINI E uses a single-stage helical gearbox which powers the MINI E seamlessly to 62 mph in 8.5 seconds and on to an electronically limited top speed of 95 mph. Although based on the familiar MINI Hatch the MINI E is a two-seater because the space normally used by rear passengers is reserved for the lithium-ion battery. This state-of-the-art rechargeable battery unit combines high output with ample storage capacity and a remarkable power output. A full recharge draws a maximum of 28 kilowatt hours of electricity from the grid. 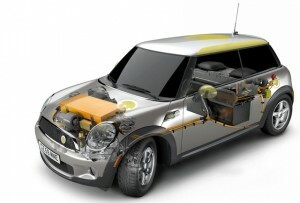 Each kilowatt hour translates into 5.4 miles giving the MINI E a theoretical range of over 150 miles. 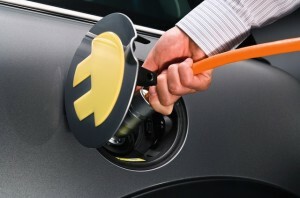 With the possibility to extend the car’s range by up to 20 per cent, as soon as the driver lifts his or her foot off the accelerator pedal, the electric motor acts as a generator. This results in braking force and the power recovered from the kinetic energy is fed back to the battery.